Digital Citizen has been re-published from Global Voices. Digital Citizen is a biweekly review of news, policy, and research on human rights and technology in the Arab World. Sign up to receive our updates. El Shad, the first magazine for the LGBTQ community in Algeria launched online on Nov. 20. The first issue was dedicated to transgenderism in Algeria. Prominent human rights activist Nabeel Rajab wrote about his recent arrest for the Huffington Post. Charged with insulting the Ministries of Defence and Interior on Twitter, Rajab could face up to six years in prison. 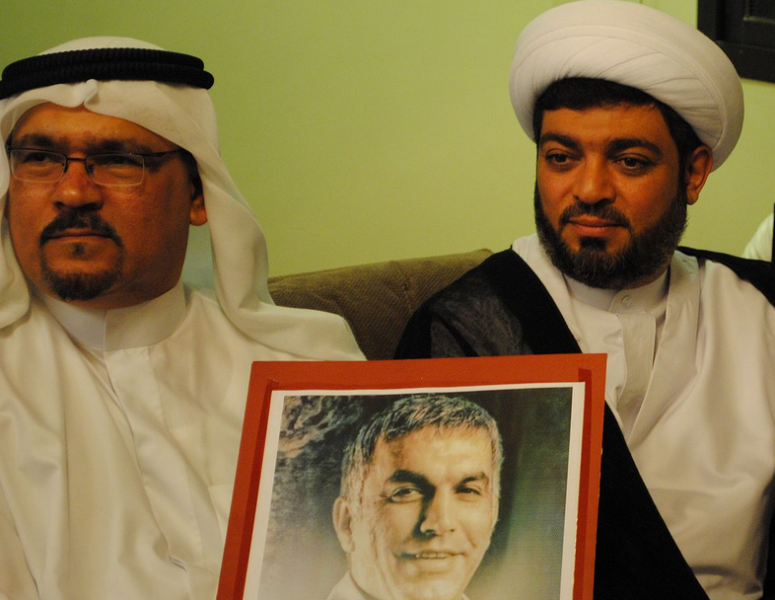 Rajab believes that the tweet in question was merely a technicality — he suspects the real reason for his arrest was a European tour he conducted last summer to talk about human rights violations in Bahrain. Sayed Jameel Kadhim, a member of the now-banned opposition group Al Wefaq Society, is facing investigation over a tweet referencing the role of “political money” in Bahrain’s legislative elections on Nov 22. In the tweet posted on Oct. 9, Kadhim alleged that those who run for the legislative elections are paid as much as 100k Bahraini dinars (roughly USD $265,000). On Dec. 1, Maryam Al-Khawaja was sentenced in absentia to one year in prison for allegedly assaulting two police women at Bahrain International Airport. Al-Khawaja boycotted the court hearing. Maryam’s sister Zainab was on the other hand sentenced to three years in jail for tearing up a photo of King Hamad on Dec. 4. The activist was sentenced to additional 16 months in jail on Dec. 9 for “insulting a government employee” and “damaging public property” in two cases that date back to 2012. Egypt’s Ministry of Defence is set to obtain a majority share in a new company to be established by the end of the 2014. The company will develop and manage the country’s telecommunications infrastructure. The step is part of a plan to issue a unified landline and mobile telecommunications license. More than 500 journalists expressed their objection to a statement published by 17 editors of state and privately-owned media in which they committed not to criticize the anti-terrorism policies of state institutions. The Association for Freedom of Thought and Expression (AFTE) published a report covering violations committed against foreign reporters in Egypt, from the onset of the 2011 uprising throughout October 2014. Trade unionist Mahmoud Rehan is facing prosecution for criticizing Egyptian authorities on Facebook. Rehan was arrested on Nov. 10 at Cairo airport, where he works. He was charged with “insulting the President” and “joining a terrorist organization,” in reference to the now outlawed Muslim Brotherhood. Egypt’s defence ministry will soon obtain a ruling share of the country’s communications infrastructure. Primary stakeholders will include the army and other security departments, as well as mobile carriers and other ministries in what will amount to greater military control over Egypt’s communications networks. The violent extremist group that now refers to itself as the Islamic State cut off all phone lines in the Iraqi city of Mosul, the group announced on Nov. 26, in an attempt to stop the circulation of information about their positions. Reporters Without Borders published a timeline of violations against freedom of information committed in Iraq and Syria. Jordanian media are now required to obtain prior authorisation from the authorities before publishing news related to “internal security affairs,” a decision taken by the country’s Media Commission. The website of media platform and Internet research group 7iber was unblocked in Jordan, after obtaining a license from the country’s media commission. 7iber was blocked in Jordan in June 2013 along with more than 200 other websites after refusing to apply for a license under an amended version of the Press and Publication Law. In a statement published on Dec. 14, 7iber explained that they had “no option but to apply for a license” in the absence of “any collective mobilization” that could change the law. On Nov. 17, Kuwait’s Public Prosecutor ordered the jailing of activist Hamed Buyabes for 10 days pending investigation on charges of insulting Saudi Arabia on twitter. Karim Hawa was detained in mid-November by the Lebanese Cybercrime Unit for sharing a Facebook a post alleging that the company contracted by the Lebanese interior ministry for the production of biometric passports has “links with Israel”. After spending few days in detention, a judge ordered the release of the 21-year-old on Nov. 17. A few weeks after, Karim got his computer and his phone back. Nicolas Fattouch, a deputy and a lawyer in Lebanon had punched a woman (a public employee on duty). Unfortunately Manal Daou (the public employee) lost her chance in suing him following the law that provides immunity to deputies after 24h from the incident, unless a case was filed before, which isn’t the case. Mosleh Sarie Dine, an online activist who called for a protest against Fattouch and his actions was sued for threatening Fattouch in a video he shared on his Facebook and spent 2 days in detention for interrogation in the cybercrime unit. Teenage rapper Othman Atiq, known publicly as Mr. Crazy, was released on Nov. 12, after spending three months in prison for his rap songs. In his music videos published on the web, Atiq depicts the lives of Casablanca’s unemployed youth and criticizes police. The International Center for Journalists published a feature article on the group of journalists in Oman who launched the first online news media outlet in the country. Palestinians living in Israel have started placing “Second Class Citizen” stamps on their Facebook profile pictures to protest a new Israeli government anti-terror plan that would give the government cause to revoke Israeli citizenship from Palestinian nationals living in their country. The plan also includes a ban on the use of the Palestinian flag and on the use of social media to express support for terror attacks. Women’s rights activist Souad Al-Shammari remains in detention for tweets she posted over a year ago, in which she criticized the kingdom’s “guardianship system” whereby a woman must have the permission of a male guardian to engage in various aspects of her life such as travelling, work, and marriage. Saudi Arabia blocked the website of the Gulf Center for Human Rights (GCHR), a non-governmental organization that documents rights violations and supports human rights defender in the Gulf region. Security company Symantec discovered a “powerful new cyber espionage program” mainly targeting people and organizations in Saudi Arabia and Russia. According to the company, a ‘Western intelligence agency” is probably behind the program. Saudi Arabia’s religious police, the Commission for the Promotion of Virtue and the Prevention of Vice, reported “shutting down” more 10,000 Twitter accounts this year over “religious and ethical violations.” A spokesman for the commission also reported that owners of many of these accounts were arrested. Amnesty International lists seven tactics deployed by Saudi Arabia to silence people online. On Nov. 26, the pro-transparency NGO Albawsala filed a lawsuit against four municipalities over the right to access information. The municipalities had previously denied the group access to administrative documents, a right guaranteed by Decree 41 of May 26, 2011. Albawsala collects these documents for its ‘marsad baladia’ project which monitors the activities of Tunisian municipalities. Amidst Tunisia’s competitive presidential race, Facebook has been accused of launching a crackdown on pseudonyms. As Raed Chammam explains in a blog post, more than one hundred Tunisian users of the site were reported for using a “fake name,” resulting in some switching to use of their real names, while others were banned from the site. Chammem writes that the accounts were reported as part of a targeted campaign against supporters of the political opposition. Human rights activist Obaid Yousif Al-Zaabi remains in detention despite his acquittal on June 24, of charges filed against him over tweets he posted more than a year ago. In those tweets, Al-Zaabi criticized the “UAE 94” trial in which 94 Emirati reform activists were convicted of plotting to overthrow the government. On Nov. 25, a court in Abu Dhabi sentenced activist Osama Al-Najjar to three years in prison and a $136k USD fine after a hearing that only lasted ten minutes. Al-Najjar was arrested on March 17 for tweeting about the torture of his father, a reform activist among the UAE 94 group. Jon Stewart speaks Arabic, talks about the NSA and press freedom. R-Shief launches new research tools allowing full and free public access to its social media archive and analytics available in more than 70 languages. In an open letter, seven human rights groups call on signatories of a global export agreement not to send surveillance technology to known rights abusers including Egypt. A number of civil society groups issued a statement at the Arab Internet Governance Forum (also available in Arabic). Digital Citizen is brought to you by Advox, Access, EFF, Social Media Exchange, and 7iber.com. This edition’s report was researched, edited, and written by Afef Abrougui, Jillian York, Jessica Dheere, Ellery Roberts Biddle, and Mohamad Najem and translated into Arabic by Afef Abrougui. Is Iraq restricting speech on Facebook? Can anybody write for digital citizen 2.2 ? This is a good step towards internet freedom.